CHOCOLATE FLAVORED COATING (WHEY PROTEIN CONCENTRATE, PALM KERNEL OIL, MALTITOL, COCOA POWDER, SUGAR, SOY LECITHIN [AN EMULSIFIER], VANILLA), VEGETABLE GLYCERINE, WHEY PROTEIN CONCENTRATE, ISOMALTO-OLIGOSACCHARIDES (PREBIOTIC FIBER), CALCIUM CASEINATE, WATER, SOY PROTEIN ISOLATE, GELATIN, COCONUT, WHEY PROTEIN HYDROLYSATE, NATURAL FLAVORS, STEVIA (STEVIOL GLYCOSIDES), COCOA BUTTER, WHEY PROTEIN ISOLATE, CALCIUM CARBONATE, SOY LECITHIN (AN EMULSIFIER), SALT, BROWN SUGAR, PEANUT FLOUR. CONTAINS PEANUTS, MILK, SOY AND COCONUT. PRODUCED ON EQUIPMENT THAT ALSO PROCESSES, WHEAT AND TREE NUTS. CHOCOLATE FLAVORED COATING (WHEY PROTEIN CONCENTRATE, PALM KERNEL OIL, MALTITOL, COCOA POWDER, SUGAR, SOY LECITHIN [AN EMULSIFIER], VANILLA), PEANUT BUTTER (ROASTED PEANUTS), ISOMALTO-OLIGOSACCHARIDES (PREBIOTIC FIBER), WHEY PROTEIN CONCENTRATE, VEGETABLE GLYCERINE, SOY PROTEIN CRISP (SOY PROTEIN ISOLATE, RICE STARCH), WATER, CALCIUM CASEINATE, SOY PROTEIN ISOLATE, GELATIN, PEANUT FLOUR, WHEY PROTEIN HYDROLYSATE, WHEY PROTEIN ISOLATE, NATURAL FLAVORS, STEVIA (STEVIOL GLYCOSIDES), CALCIUM CARBONATE, SOY LECITHIN (AN EMULSIFIER), SALT, COCONUT. CONTAINS PEANUTS, SOY, MILK AND COCONUT. PRODUCED ON EQUIPMENT THAT ALSO PROCESSES WHEAT AND TREE NUTS. CONTAINS PEANUTS, MILK, SOY AND COCONUT. PRODUCED ON EQUIPMENT THAT ALSO PROCESSES WHEAT AND TREE NUTS. WHITE COATING (MALTITOL, PALM KERNEL OIL, MILK PROTEIN ISOLATE, NONFAT DRY MILK, SOY LECITHIN [AN EMULSIFIER], DISTILLED MONOGLYCERIDES, NATURAL FLAVOR, SUCRALOSE), WHEY PROTEIN CONCENTRATE, GLYCERINE, ISOMALTO-OLIGOSACCHARIDES (PREBIOTIC FIBER), SOY PROTEIN ISOLATE, CALCIUM CASEINATE, GELATIN, WATER, SPRINKLES (SUGAR, CORN STARCH, VEGETABLE OIL [PALM AND PALM KERNEL], DEXTRIN, SOY LECITHIN, CONFECTIONER'S GLAZE, RED 40 LAKE, YELLOW 5 LAKE, NATURAL AND ARTIFICIAL FLAVOR, YELLOW 6 LAKE, CARNAUBA WAX, BLUE 1 LAKE, RED 3, BLUE 1, RED 40), WHEY PROTEIN HYDROLYSATE, PALM KERNEL OIL, WHEY PROTEIN ISOLATE, BROWN SUGAR, NATURAL FLAVORS, SOY LECITHIN (AN EMULSIFIER), SALT, STEVIA (STEVIOL GLYCOSIDES), PEANUT FLOUR, COCONUT. 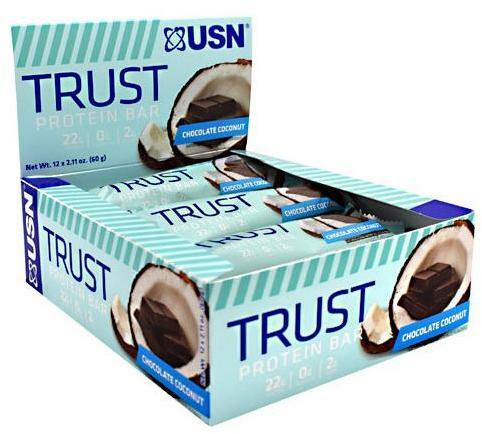 USN Trust Bar is a delicious snack replacement protein bar that can be enjoyed anytime, anywhere. It is perfect on-the-go protein fix, and with it’s 3 delicious flavors, it’s an ideal cheat as part of your healthy lifestyle. USN Trust Bar has 22g of high quality protein per serving. It is low in impact carbs, contains 0g trans fats, and only 3g of sugar.